Collapsing Earth: Why Are Giant Sinkholes Swallowing Cars, Homes And People All Around The World? Has the crust of the earth become more unstable? All over the planet, giant sinkholes are forming. Many of them are so massive and are opening up so suddenly that they are actually swallowing cars, homes and even people. So why is this happening? Is the earth’s crust collapsing? Is it expanding? Is something else to blame for this phenomenon? It seems like there is a story about another giant sinkhole in the news almost every single day now, and scientists seem to be at a loss for an explanation. Could human activity be responsible? Yes, the number of sinkholes in the United States definitely seems to be increasing, but we are also seeing massive sinkholes occur all over the globe – often in very rural areas. There just doesn’t seem to be any pattern that would seem to indicate that human activity is the primary factor. Hopefully scientists can figure out whatever is causing it, because this epidemic just seems to keep getting worse. A 60-foot-wide sinkhole formed under a resort in central Florida late Sunday, forcing guests out of their rooms as one three-story building collapsed and another slowly sank. Guests at the Summer Bay Resort in Clermont, about 10 minutes from Walt Disney World, called for help before the collapse, saying they heard loud noises and windows cracking. All guests inside the buildings — an estimated 35 people, authorities said — were evacuated before the first structure crumbled. In one of the adjacent buildings, firefighters and police officers knocking on doors woke up Maggie Moreno of San Antonio. She couldn’t get the door to her unit open all the way. Insurance adjusters and geo-technicians spent Wednesday morning at the scene of a large sinkhole that opened in the backyard of a Winter Park home. The hole, which measures 50 feet wide and 30 feet deep, swallowed a swimming pool when it opened late Monday night. No one was injured. Orange County building inspectors declared a two-story home at 2300 Roxbury Drive and a utility shed “unsafe” to occupy as a result. But these kinds of sinkholes are not just forming in Florida and in other places where geologists are telling us that they are “supposed” to be forming. 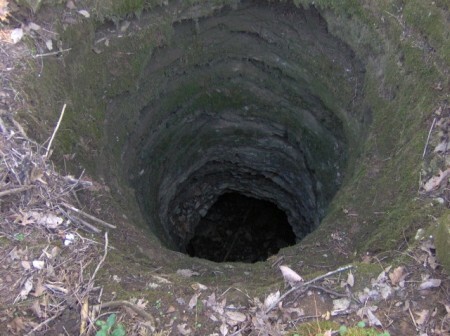 A massive sinkhole has opened in a Kansas field, drawing tourists for an ill-advised look into the void. A Wallace County rancher found the sinkhole on Aug. 1 on land about 20 miles from the Kansas-Colorado border. The hole is about 90 feet deep and 200 to 300 feet wide. Landowner Dalton Hoss said his brother discovered the crater-like pit while surveying pastureland. Wallace County Sheriff Larry Sanders said the sinkhole appeared out of nowhere. A section of a downtown commercial street swallowed a backhoe on Monday as city crews were getting ready to repair a leaky water main. The backhoe had started to chip at asphalt near the corner of Ste-Catherine and Guy streets when the ground crumbled beneath it and the heavy machine tumbled in. The driver of the backhoe was not injured but was taken to hospital to be checked out as a precaution, city officials said. Scott and Robin Spivey had a sinking feeling that something was wrong with their home when cracks began snaking across their walls in March. It wasn’t long before the houses on both sides collapsed as the ground gave way in the Spivey’s neighborhood in Lake County, about 100 miles north of San Francisco. But that is nothing compared to what is happening down in Louisiana. As you read this, the entire town of Bayou Corne, Louisiana is being swallowed by a sinkhole. Sometimes these sinkholes appear so suddenly that people are actually being swallowed by them. Back in February, an absolutely enormous sinkhole appeared so rapidly underneath a home in suburban Tampa that it swallowed a man while he was sleeping. The man woke up as he was being pulled into the earth and he started yelling for help. His brother tried to pull him out but it was too late. His body has never been found. Can you remember ever hearing of such bizarre sinkhole stories in the past? This phenomenon is happening all over the nation. This year sinkholes have caused major roads to close in New Jersey, in Arizona, and in Ohio. It was estimated that the road that was swallowed in Ohio would be closed for months. Over on the other side of the planet they are experiencing a similar thing. For example, a giant sinkhole recently swallowed an entire cement truck over in China. FIVE people have died after a 10-metre wide sinkhole opened up at the gates of an industrial estate in Shenzhen, the southern Chinese boom town neighbouring Hong Kong. The Shenzhen Longgang district government said on its verified page on Sina Weibo, China’s version of Twitter, that five people had died and added that it was investigating the incident. The sinkhole formed just outside the Huamao Industrial Park in Shenzhen on Monday evening, at a time when many factory workers would have been changing shifts, according to the website of Beijing-based newspaper the Guangming Daily. The state-run Shanghai Daily newspaper said that rescuers saved one man. So what do scientists have to say about this? Have they come to the conclusion that the number of sinkholes is increasing? The answer is we don’t know, because we just don’t have enough data. Sinkholes aren’t widespread events like hurricanes or earthquakes. They’re very localized. A lot of karst areas are agricultural, because they tend to have very good farming soil. And sinkholes happen all the time in farmers’ fields. But there’s no national or international sinkhole database. Still, as our population grows and we develop more areas that are susceptible, we seem to be seeing more sinkholes—and more stories about humans being impacted by them. And it is true that it is hard to find “official numbers” for sinkholes. But that could just be a coincidence, right? And all of the news stories about giant sinkholes that are popping up this year could just mean that people are noticing them more than they used to, right? You can believe that if you want. Personally, I am convinced that something very strange is going on. I can’t explain precisely why it is happening, but it does seem clear that the size and the frequency of sinkholes are both increasing. Do you believe that this giant sinkhole phenomenon is something to be concerned about?